Click here for audio of Episode 1801. Today, a windmill report. The University of Houston's College of Engineering presents this series about the machines that make our civilization run, and the people whose ingenuity created them. Every few years in this series I need to go back and revisit windmills. They first appeared in the Arab world, maybe twelve hundred years ago. A radically different form of windmill turned up in Northern Europe around AD 1200. And it never left. 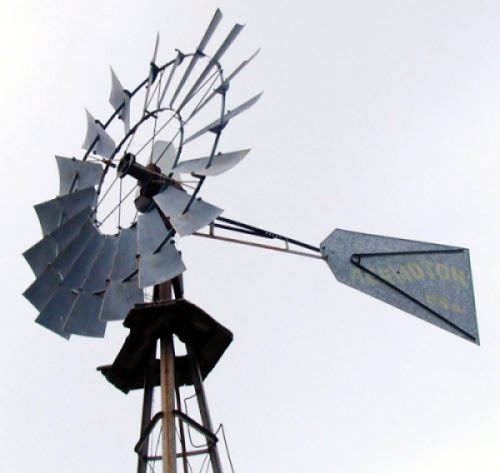 The eighteenth century saw windmills with feedback control systems. They kept the fan facing into the wind and varied the pitch of the blades to compensate for changing wind speeds. The American farm windmill was perfected in the late nineteenth century, and we still see it, everywhere. Now, as truly grand windmills promise to provide significant electric power, even their name has changed. Now they're "wind turbines." They no longer directly mill grain. And that word turbine refers to rotating blades, systematically designed to collect as much power as possible from a stream of air or water. These aren't fundamentally different from windmills and waterwheels. They're just far larger and more efficient. Their complex designs better adapt them to the unsteady and inconstant wind. They operate in winds from roughly ten to fifty miles an hour, and they do best in winds of about thirty miles an hour. The electrical output of a wind turbine has to match the alternating current that flows in our power lines. The propeller speed can be held constant by varying the pitch of its blades and controlling its speed electrically. Or the speed can be allowed to vary and the power output converted to sixty hertz AC. An earnest young man, handing out literature on wind power, recently stopped me. He did a fine job until he told me that wind power did no environmental damage. "Oh," I asked, "what about manufacturing all that capital equipment? What about the vast land they occupy -- the birds they kill?" He said he'd go get the answers and have them the next day. Of course the only answer is that any large-scale power production sullies our environment -- no matter what kind. We need to quit looking for panaceas and learn the ancient art of compromise. Those great blades, whirling in the sky, are ideal in some places (like the wind-blown plains of La Mancha), but they're a poor choice in others. Some wealthy environmentalists have been alarmed to find them rising near their own country estates. The wind turbine is a glorious machine. But we need to mix and stir: photovoltaic cells; nuclear, direct solar, wind, water, and tidal power; fossil fuels along with energy conservation measures. What we really need to remember is that no one-size-fits-all technology will ever solve our voracious energy needs. For a great deal on wind turbines and other renewable energy forms, see the January-February 2003 issue of Renewable Energy World, Vol. 6, No. 1. See especially pp. 30-40 and 83-89. K. Q. Seelye, Windmill Farms Sow Environmentalists' Identity Crisis. New York Times, National Report, Thursday, June 5, 2003, p. A22. This page on large wind turbines.